Abunai! - "The Mystic River Sound"
I can't even remember where or when I bought this album. But I must've simply noted the Camera Obscura logo on the back cover and vaguely recalled the band's name from previous visits to the label's website, and then picked it up on a whim. Good decision - it's near the top of my 1999 10 best!! Hard to tell who these guys really are - the liner notes presented in the booklet are some sort of clever send-up, suggesting that this is some sort of compilation of Boston area psych bands doing individual numbers in styles from all ages of rock history (60's-present at least). On the back cover, we learn who they *really* are though, a foursome (yes, from Boston) who wrote all but two (traditional) pieces of the eleven tunes on the disc. 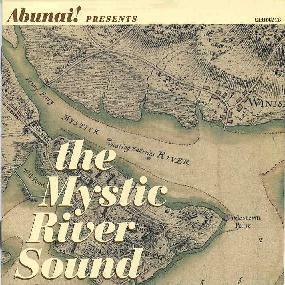 So in the end, the 'Mystic River Sound' is simply Abunai! themselves, and it's a damn good one! On the surface, the 'formula' for the sound seems rather unspectacular, mostly mid-tempo melodic songs with a psychedelic twist, easily sung to, and not reliant upon unusual arrangements or instrumentation most of the time. But these songs really 'get me' - some of Nick Saloman's tunes are of the same ilk, but never have Bevis Frond put so many good ones on one album. All four members share vocal duties and all are well done. It only takes three tracks to discover that 'Mystic Sound' is something special. 'Tomorrow' is one of those mid-tempo pop/psych (almost shoegazing) tunes I was telling you about - it really is marvellous. The traditional "Barbara Allen" is next, with the vocals sung as if reciting a Norse saga. "Learning to Ask" could certainly appeal to just about any hip teen into 'college radio.' I think this is what Porcupine Tree were trying to lock into with 'Stupid Dream,' only Abunai! have hit the nail exactly on the head. "Learning to Ask" is simply the best 'song' written in 1999. Before you think that Abunai! is only about melodic rock, you need also to hear the fabulous instrumental psych freak-out "Vanishing Point." The noodling bass style of Dan Parmenter and Kris Thompson's flute-like keys delight my senses just as any classic Trilogy Gong tune. Songs late in the album are really strong also, so only seem to pale ever so slightly from the great first half. "Mechanical Kingdom" isn't the album's best song, but Brendan Quinn's fabulous wah-guitar playing is first rate. "Rock Song" blazes right on through with more of the same, and top-fuel excitement to boot. "Toast" tops it all off with a Velvets-style kraut-groove romp - Man, these folks are good! A fabulous finale to a can't miss album.